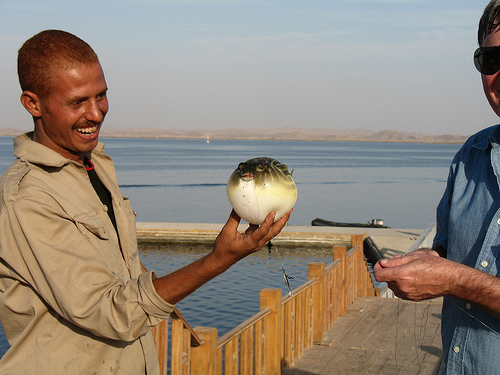 It may seem odd that the 30 Second Fisherman would ever not want to catch a fish, but that was the fearsome reality on Lake Nasser, where the world�s largest perch can be found. Not a little 2-pound variety, but the 300-400lb kind. My travel rod and kit could handle a 10, possibly 20, pound fish, but anything that size would tear me out of the boat. As I was on an antiquities tour, I also could not afford the time. If one applies �tarpon rules� � allow one pound per minute � where a 90lb tarpon could take an hour and a half to land, these babies would take over 5 hours. Oh, and eat tarpon for lunch. As it was, we were lucky to catch our first ever puffer fish � or donkey fish as locally known � at Amada. 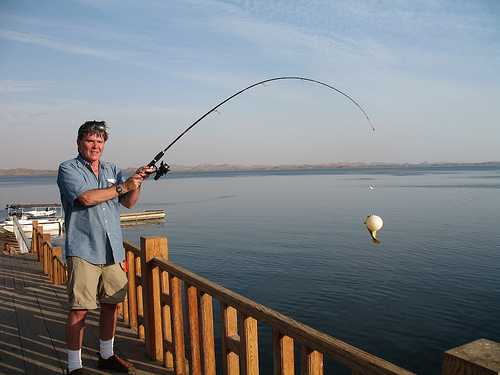 Had no luck in Aswan, but next time would fish the west bank, or the west side of Kitchener Island. In fact, the best looking structure was about a half-hour further south at the First Cataract. There are small perch-like fish along the docks at most cruise boat tie-ups. Our success was due to a #8 snelled circle hook with FishBites bloodworm. Not since China, have I seen so many sites that overwhelm a video camera. In two weeks one can be exposed to a history spanning 3000BC to 1500AD � to the present. Hard to believe a more perfect, idyllic place: the Nile is not so wide one could not swim across it. Desert to the west, palm trees on the east, lush to the banks. Q: What is the music the cruise ships play as they turn the corner into port at Abu Simbel? It is not really a fear of heights you will remember; don�t look down, look away, at the sunrise, hills, houses. Take a hat. If you are standing in the corner of the balloon basket, the heat from the flame will feel like it is burning your hair. If you are taking video, and recording the lecture, be aware that firing up, to maintain altitude, is very noisy. If you insist on smoking a [fruit flavored!] shisha in Khan el-Khalili, be prepared for a lot of work. Think blowing out birthday candles, but in reverse.